Bollywood loves its own history. Too many Hindi films cater to fans with a depth of Bollywood knowledge at the expense of newcomers to the genre, who feel left out of the inside jokes. The neo-noir thriller Johnny Gaddaar (“Johnny the Traitor“) avoids that trap, enthusiastically paying homage to the past while providing enough context to welcome Bollywood newcomers. It helps that writer-director Sriram Raghavan really understands how and why stories work onscreen. That understanding manifests subtly in the two films he made after Johnny Gaddaar: Agent Vinod and Badlapur. In Johnny Gaddaar, his references are explicit, using clips from other movies to advance his own heist story. “Johnny” is an alias used by Vikram (Neil Nitin Mukesh), junior member of a quintet that runs a gambling ring. Veteran crook Seshadri (Dharmendra) holds together the uneasy group, which consists of Vikram, casino owner Prakash (Vinay Pathak), financier Shardul (Zakir Hussain), and the crew’s muscle, Shivay (Dayanand Shetty). Vikram breaks a cardinal rule by falling in love with Shardul’s wife, Mini (Rimi Sen). In order to get enough cash for the two of them to flee to Canada, Vikram decides to steal the money the group pooled for a deal with the corrupt policeman, Kalyan (Govind Namdeo). Even though he’s the most educated member of the crew, Vikram is also the newest to a life of crime. He concocts a solid plan to steal the cash, going so far as to chloroform himself in order to time how long his victim will remain unconscious. Yet he lacks the wiliness of an experienced crook, and his plan goes wrong in ways he never anticipated. The primary theme of the film is the danger of unintended consequences, not just the direct effects on one’s own life but the psychological damage incurred when one inflicts pain on others, intentionally or not. Vikram and his gang aren’t violent. He doesn’t own a gun, and the others aren’t in the habit of carrying theirs with them. Shiva is a gentle giant. When Vikram experiences his first taste of violence, it disturbs him. Sadly, that first experience makes violence a possible response to future conflicts, in a way it never was before. It helps that Mukesh — in his first film role — looks as young and slight as he does. He doesn’t appear the least bit tough. It’s easy to accept him as the naive character he plays. There’s another theme in the film about the nature of love, namely that Vikram doesn’t know what real love is. How can he be sure of his feelings for Mini or her feelings for him when they developed under duress? Vikram protests to Seshadri that their love is real, and Seshadri just shrugs. Seshadri is one of multiple examples of what true love is that Vikram ignores in pursuit of his affair. Widowed Seshadri reminisces while listening to a recording of his wife singing. Prakash dotes on his wife, Varsha (Ashwini Kalsekar), a proud working mom. Shiva has a sweet, budding romance with the nurse who cares for his ailing mother. Shardul doesn’t seem like such a bad husband to Mini, at least by mafia-film standards. He comes home and wants to catch up on the day with his wife, but she can’t get away from him fast enough. Her disgust for him is so obvious that you almost feel bad for the guy. Even Kalyan — who is the scariest character in the film — tries to warn Vikram about the danger he’s in. When Vikram confesses that his favorite actor is Amitabh Bachchan, Kalyan asks if Vikram has seen Parwana, a movie in which Bachchan plays an obsessed lover who resorts to murder when his beloved falls for another man. Of course, Vikram hasn’t seen the movie. Clips from Parwana are interspersed throughout Johnny Gaddaar, along with snippets of other Bollywood and Hollywood films. For movie buffs, it’s fun to try to spot all of the references Raghavan includes in his movie. The references never derail the story, and Raghavan makes some explicit enough that even non-movie buffs can feel included (as when Seshadri says he feels like he’s in a scene from Scarface as the gang counts their loot). 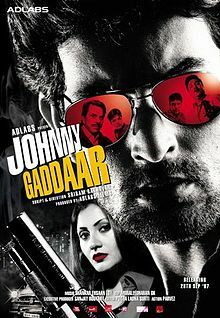 Johnny Gaddaar is a balanced, solid thriller that feels like a love letter to films of the past. It’s worth watching just to see an early piece of work by a promising director. This entry was posted in Reviews and tagged 2007, 3 Stars, Ashwini Kalsekar, Bollywood, Dayanand Shetty, Dharmendra, Govind Namdeo, Hindi, Indian, Johnny Gaddaar, Movie Review, Neil Nitin Mukesh, Parwana, Rimi Sen, Sriram Raghavan, Vinay Pathak, Zakir Hussain on June 10, 2015 by Kathy. Great review as always Kathy. I would urge you to seek out Raghavan’s debut directorial effort Ek Hasina Thi (There was a Beauty) from 2004. I’m sure you’ll enjoy it. Its my favorite sriram raghvan film. But do watch his first film ‘Ek Haseena Thi’ as well. Its amazing. Finally! Awesome movie. Glad you got to watch this. Mukesh had a great debut, too bad his career kind of fizzled out after this. Poor guy. I wish Mukesh would be content to be second banana to a bigger hero or a member of an ensemble, at least for the time being. He was good in 7 Khoon Maaf, but his starring roles lately have been duds. Great review. I rate Johnny Gaddar better than Andhadhun. Ek Hasina Thi was equally thrilling. I was somewhat disappointed with Badlapur. Thank you, Ad Zad! What I like about Sriram Raghavan’s filmography is that every movie he’s made has something really great about it. I can honestly see any of his movies being someone’s favorite.